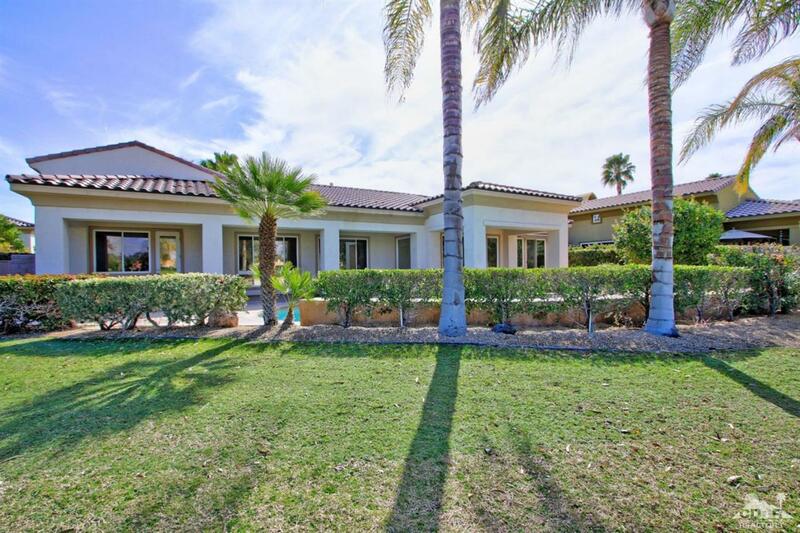 Spectacular Location with Views of the Mountains and Multiple Arnold Palmer Course Fairways. Enter through a gated courtyard with outdoor living and fireplace. Entry hall leads to Great Room with mountain views, dining and entertainer's wet bar. Open Social Kitchen, Family Room and Informal Dining for today's lifestyle. Kitchen features an island and bar seating with granite countertops. Family Room with high ceilings, fireplace, french doors and sliders to outside living. Master Suite with custom built-in closet, spa bath with slate finishes and a retreat area/office/gym. 2 guest bedrooms, one with ensuite bath, are on a separate wing and perfect for family and friends. New Carpet recently installed. Outside is a resort with Covered Outdoor Living and pool and spa with waterfall all overlooking amazing views of the Palmer course and the south and west mountains. Come home to your desert oasis!